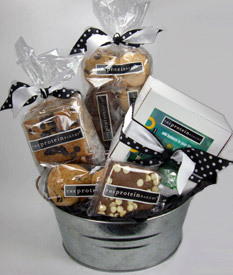 You can buy this large Gift Pail for a great gift. Bigger is better right??.... Well come to find out there are many things that bigger is never better. My waist line is one of those things and new Protein Bakery Minis is another. The bad thing about a smaller waist is it means that you have to change what you eat. I have found that having a protein filled snack after my evening work out really helps to not only help my muscles heal from the workout but to keep me from craving those "bad" snacks. At 100 calories a piece they are the perfect size to help me not indulge to an unhealthy point. I was lucky enough to get to try a large selection of these new mini both the brownies and the cookies. I have to say my favorite was the Pumpkin Walnut Cookies, which are a new seasonal cookie they have available and will certainly fill you seasonal cravings. Out of the brownies I tried I like the Peanut Butter Chocolate the most.These treats are perfect if you are looking to start a new and healthier you in the upcoming year and would make a great gift if you know someone else who is. Make sure to check out a moment and look through their Gift Packages for that special someone. The Protein Bakery wants to offer up a great way to start your New Year to one of my readers make sure to enter on the Rafflecopter below for your chance to win. The chocolate chip blondies look awesome! Pumpkin Walnut Blondies!!! OH MY GOSH! YUMMY!!! I'd love the Oatmeal Chocolate Chip cookies. The peanut butter brownie looks delicious! I would like to try the Pumpkin Walnut Chocolate Chip Cookies. I would like the Pumpkin Walnut Blondie look good. I would like the peanut butter chocolate chip. The Chocolate Chocolate White Chocolate Chip looks oh-so yummy! The peanut butter white chip cookies sound awesome. Everything looks amazing! I'd really love to try the Espresso Chip Brownie! Espresso with cappicino chips and the coconut, walnuts with dark chocolate chips they were two that really stood out but then they all look so delicious. Tank you for the giveaway. Happy Holidays! Peanut Butter Chocolate sounds perfect to me. I love the sound of the Black and White Brownies! Chocolate Chocolate White Chocolate Chip are my favorites. I think the Ginger Oatmeal Raisin Cookie look yummy. Peanut Butter Brownie sounds great!